KAZAN, Russia (AP) — Everyone was waiting for Germany to score another late World Cup-saving goal. All four teams in the group had a chance to advance in games that were being played simultaneously, but Sweden's 3-0 lead over Mexico put Germany in prime position to move on as well -- if the Germans could score against the South Koreans. Loew had changed his line-up to mix youth with experience, calling back Hummels, Sami Khedira and Mesut Ozil while also fielding Niklas Suele and new Bayern signing Leon Goretzka. Suele made his first World Cup appearance as a replacement for Jerome Boateng. Germany made a nervous start, playing slower than it usually does to avoid being vulnerable on the break. But the strategy did not bring much success in the first half. 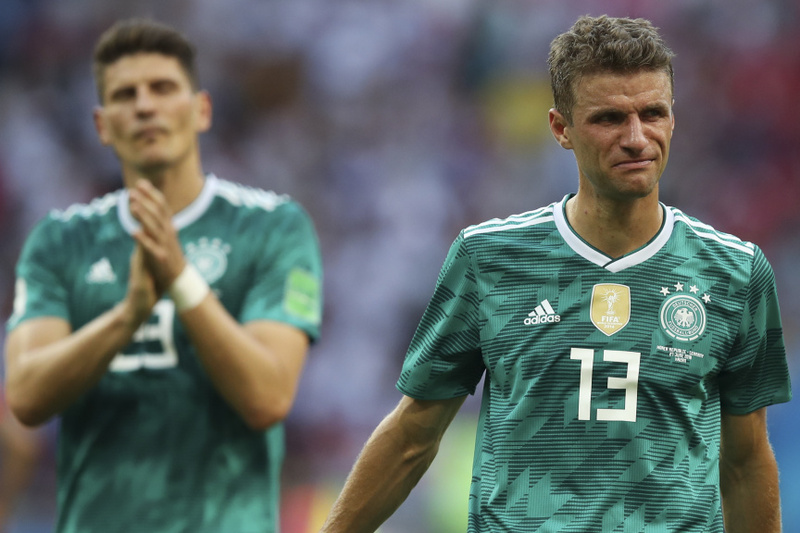 The Germans kept peppering the South Korea box with harmless crosses and it was their opponents that came close to scoring from a set piece in the 19th minute after Neuer failed to control a 25-meter free kick from Jung Woo-young. The Germany keeper bobbled the ball and needed to swipe the rebound away from the attackers after a spectacular dive. The Germans continued at the same pedestrian pace after halftime and Ozil had another poor display, with many of his passes uncompleted. Loew brought on substitutes Mario Gomez and Thomas Mueller on either side of the 60-minute mark but his players kept giving the ball away, with most of their attacking combinations lacking precision and speed. Gomez had a decent header stopped by goalkeeper Jo Hyeon-woo in the 68th minute and could not properly connect with a low cross from Joshua Kimmich in the 72nd as Germany's hopes vanished. "We did not deserve to be winning the title once again," Loew said.